Frances Westall was born in Johannesburg, South Africa (1955). She grew up in the United Kingdom, and studied geology at the Universities of Edinburgh in Scotland and Cape Town in South Africa. 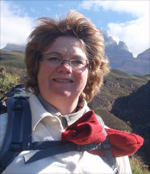 She refers to herself as a scientific "vagabond", having worked in many countries including a postdoc in marine geology at the Alfred Wegener Institute in Bremerhaven (Germany), followed by research in geobiology (fossil bacteria) at the Universities of Nantes (France) and Bologna (Italy). She was a senior researcher at the NASA Johnson Space Center and the Lunar and Planetary Institute in Houston (USA) in the period after the announcement of possible traces of life in the martian meteorite ALH84001 by David McKay and his group before becoming the leader of the Exobiology Group of the CNRS in Orléans (France) in 2002, a position she took over from André Brack, a noted prebiotic chemist. She was head of the French Exobiology society from 2006-2008. Specialising in the oldest traces of life on Earth, she is very involved in the 2018 international mission to Mars from the instrumental side (microscope/close-up imager) and from the science side as well. The habitability of a planet can be defined as "the conditions permitting the existence of life". This means having liquid water in contact with rocks and minerals, carbon, other essential elements (H-C-N-O-P-S) as well as transition metals, and energy. The habitable conditions with respect to an origin of life are different in terms of temporal and spatial scales compared with those necessary for established life or simply for the survival of life. For life to originate, given the necessary time scales (hundreds of thousands to a few million years), this means relatively large bodies of water in which there is hydrothermal activity, since the first life forms are thought to have originated in such systems. The formation of large molecules that are the building bricks of life is thought to have been favoured by reactions and conformations on the surfaces of reactive minerals in hydrothermal systems, but at temperatures below 80°C. The first cells were simple, probably micelles containing molecules capable of replicating the cellular structures. Life arose on a planet that was characterised by extreme environmental conditions compared with those on the present planet Earth. However, it is more realistic to consider that the environmental conditions reigning on Earth today are extreme (and we humans are the extremophiles) because the early Earth conditions were and are more common in the Solar System and probably in the Universe. Microorganisms that are considered to be extremophiles are those restricted to habitats having either the completely anaerobic conditions of the early Earth, or occurring in areas where environmental conditions are at the extreme of the known limits of life – very hot or very cold, very deep, very salty, very acidic or very alkaline, high radiation levels, etc. The pace of the evolution of life increased rapidly once oxygenic photosynthesis had been established and free oxygen was available. Larger organisms with more sophisticated metabolisms and more complexity required access to huge energy sources, fuelled by oxygenic photosynthesis. The evolution of life on Earth is also linked to the geological evolution of the Earth. The search for traces of the early life is challenging, the early organisms being very small. Their fossilised expressions in the rocks are therefore subtle. The earliest traces of life date back to almost 3.5 billion years (Ga) ago. Sedimentary rocks from South Africa and Australia contain fossilised microorganisms that include "rock eaters" (chemolithotrophs), probably the organic-eating heterotrophs, and anoxygenic photosynthesisers. These are already relatively evolved life forms. Tectonic recycling of the Earth's early crust has destroyed any vestiges of the early steps of life. This was not the case on the planet Mars, where crust 4Ga and older is in abundance. The search for life on Mars will thus (1) help us to determine that life is a "universal" phenomenon, and (2) help us to understand the origins of life and its earliest evolution. The Earth formed 4.56 billion years (Ga) ago from the consolidation of planetesimals in the Solar System. Its earliest volatile layer was destroyed by an impact with a planet the size of Mars. This glancing impact formed the Moon. The continuing arrival of volatile-rich meteorites, micrometeorites and comets furnished the Earth with new volatiles that formed the oceans, the atmosphere, and brought in the carbon building bricks of life. An important process in the evolution of the Earth was the initiation of tectonic activity that recycled the crust. This recycling was fundamental for the further evolution of life on Earth because it is the only way to renew essential nutrients on a long-term basis. The process of continent formation was also evolutive, the earliest "continents" being rather like submerged oceanic plateaux. Continents as we know them today started appearing about 3.2 Ga ago by the amalgamation of smaller continental blocks. As the continents grew, the worlds' oceans deepened. Typical tectonic, volcanic and sedimentaryprocesses have prevailed over the last 3 Ga of geological history leading to the formation and destruction of supercontinents. Several global glacial episodes have been identified, at 2.9 Ga (? ), ~2.3 Ga, ~720 Ma, the causes of which are debated but may be related to life and the rise of oxygen in the atmosphere. The present glacial climatic conditions were probably related to the breakup of the super continent Pangea and the isolation of Antarctica at the South Pole, which induced the actual ocean circulation patterns. How do we search for life on Earth or on another planet? Techniques used in the field on Earth and in terrestrial laboratories can help define strategies for looking for rocks that may contain traces of past or present life on Mars. The first steps concern understanding of the environment of formation of the rocks. Were the rocks formed in an environment that was habitable by microbial life forms? If yes, what are the chances of long-term preservation of the traces of past life in these rocks? In the next steps, it is necessary to make detailed investigations of the rocks to determine whether the rocks contain potential morphological and/or organo-geochemical biosignatures. The primary concern will be the evaluation of the biogenicity of the potential signatures: what is their nature, could they have been formed by abiogenic processes or only by biological processes? On Earth, especially when dealing with ancient rocks, it is necessary to evaluate the age of the biosignatures – were they formed at the same time as the rock or are they later (younger) intrusions? This aspect is less important on Mars although it will nevertheless be necessary to determine the syngenetic or endolithic nature of the potential biosignatures. Given the difficulties encountered in determining biogenicity and syngenicity even with ancient terrestrial biosignatures, it will be necessary to return suitable martian materials to Earth for definitive studies.